I’m calling it as DA’s second error in a calendar month! Here, 8, 27 and 64 = cubes = die, which is incorrect because die is the singular form of dice, meaning that the clue should have been 8, 27 and 64 dice. It’s too bad, because it would have been a candidate for DA Gold otherwise (I like maths, and I have a sneaking suspicion that mathematically-minded people are the best at cryptics). Update: This is not actually an error. AL set me on the right course. As AL pointed out, I am in error here, not DA. 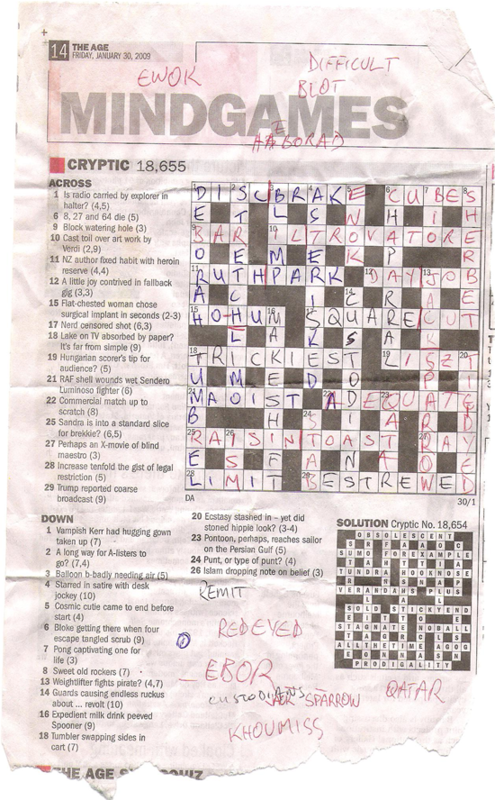 I read the clue as suggested above, 8, 27 and 64 = cubes = die, which would have been a DA error. The alternative is to read it as 8, 27 = cubes = 64 die, which is not a DA error. Halter = disc brake. The rest? RC called it early as ewok = cosmic cutie. What we never managed to work out is an explanation. I kind of cheated on this one by looking up the dictionary to get scrub = chaparral. Bloke = chap is obvious, the rest not so. NZ author = Ruth Park and reserve = park, but how can fixed habit with heroin = ruth? Liszt = Hungarian, but how does the rest work? Sendero Luminoso fighter = Maoist, but that’s all I’ve got. We figured that restriction = limit, just that we had no explanation for it. I got guards = custodians from the cross clues. I had no explanation for it, though. RC again called it early with on the Persian Gulf = Qatar. While sailor = tar is easy enough, how does pontoon, perhaps = qa? 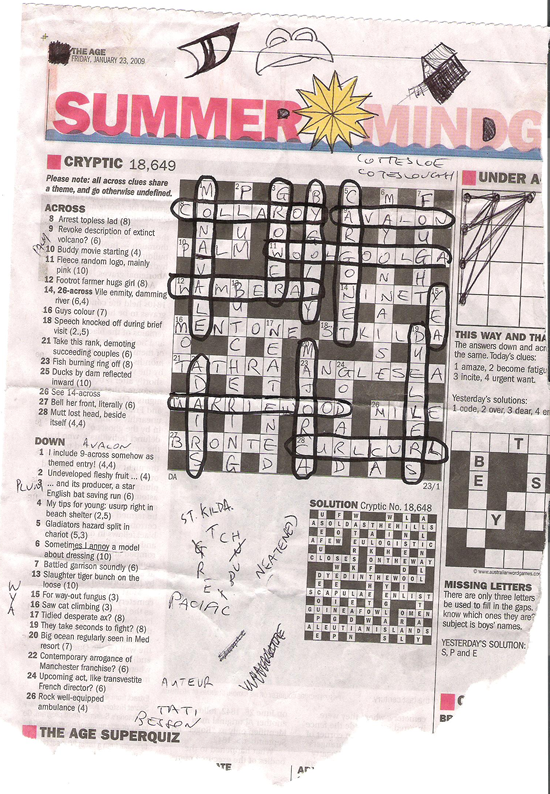 The Saturday Age says stretch limo, just that I don’t even know what the direct clue is. Here, mutt = cur, lost head = l and mutt lost head, beside itself = curl curl = beach. That beside itself is nice. I like this one because DA hid the direct clue so well. It’s tips for young = yg, beach shelter = brolly, usurp right in beach shelter = bolly and tips for yound: usurp right in beach shelter = by golly = my. It’s exceptionally difficult, but exceptionally good. Here, desperate = in need and ax = aten (x as Roman numeral), and the synonym for desperate is then interpreted cryptically, meaning that desperate ax = in need aten = neatened = tidied. It goes footrot farmer hugs girl = wamberal = beach, but I hadn’t heard of the beach and amber = girl is pretty goddamn nasty. We got ninety mile from this, and whilst it looks like an anagram clue, we couldn’t quite work it out. Even though bronte, the answer, has the be of bell in it and the ront of front in it, no explanation could be found for why. The answer here is avalon, which has many of the letters of volcano in it, but why or how avalon comes of it was beyond us. Ducks I’m assuming refers to the oo of warriewood, but everything else is a mystery. RC and ?? had a quick look at it on Friday before RC and I got together on Saturday at Spuntino’s to have a crack at it over sangria. And as can be seen, we were absolutely destroyed; although we deciphered the theme early on, we knew of few beaches and didn’t get very far with the other clues. Sadness, sadness and destruction, but that was to be expected given last week’s victory. So elegant, so succinct: love = zip, each = per and love each = zipper = fly. DA finds a milk product in a milk product: milk product = curd, largely stale = sta and milk product includes largely stale = custard = milk product. Very amusing anagram: about wellbeing status = sweating bullets = nervous. And in what must also be a first, there’s only one clue I can’t figure out. I figured management spot = admin, but I don’t even know where to begin for an explanation.